Police will issue ID cards to eight-year-olds as part of security measures at next year's Gleneagles G8 summit. As many as 500 locals will be asked to carry photographic identification in order to pass checkpoints and roadblocks surrounding the meeting. Under-eights will not require any ID as they can be included on their parents' or guardians' cards. Tayside Police said the measures were "standard procedure" for a gathering of the world's most powerful leaders. The photo IDs will be handed out to residents of neighbouring Auchterarder. Tight security will surround the meeting to be held from 6 to 8 July at the Gleneagles Hotel in Perthshire. Its remote location will help security arrangements but summit organisers still fear it will be targeted by protesters and that some of the demonstrations could turn violent. Police have warned "the full force of the law" will be used against any demonstrators seeking to wreck the event. But senior officers have also extended an olive branch to mainstream protest groups, who may be planning to demonstrate peacefully at the Gleneagles event, urging them to make advance arrangements with police. The officer in charge of next summer's police operation, Chief Superintendent Brian Powrie, said: "Tayside Police is making preparations for a major security operation at Gleneagles Hotel and the surrounding area. "It is standard procedure for such events and requires those who live close to the venue to carry identification so they can get through any police checks with the minimum of inconvenience. "This involves a relatively small number of people being photographed and issued with a pass by the police. "Children under the age of eight will not require to be photographed but will be included on their parents' or guardians' identification. There is no upper age limit." Peter Everett, chairman of Auchterarder and District Community Council, said opinion was divided about the potential impact of playing host to Prime Minister Tony Blair and the leaders of the USA, Canada, Japan, Russia, France, Germany and Italy. He said: "A lot of businesses think it will be an opportunity for more business. "A lot of residents wonder why they did not move it on to an aircraft carrier. "There is a bit of concern, not about the G8 itself, but about the potential for violent demonstrations." Nationalist MSP Roseanna Cunningham condemned the plans and said they would represent the "tip of the iceberg" in terms of the disruption that will be caused to the local community. Ms Cunningham said: "This is an absolute outrage and I cannot see how it can be unilaterally imposed on the people. "What are the police going to do if someone goes out to do their shopping and forgets their card or when kids are in and out from their homes like normal kids during the holidays? "Are they going to be subjected to police checks at every turn? "My fear from the beginning was that this was the sort of thing that would happen. "Here it starts and I suspect this will only be the tip of the iceberg when it comes to disruption to the everyday lives of the people of Strathearn." 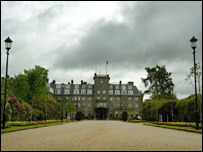 In June, Mr Blair confirmed that, under the presidency of the UK, Gleneagles would host the 2005 summit. The announcement followed the conclusion of the 2004 summit on Sea Island, Savannah, USA. Charities, trade unions and campaign groups have also called on Mr Blair to fight poverty as part of the 2005 summit. They want him to stop big business from "profiting at the expense of people and the environment" through new legislation. Oxfam in Scotland has called on him to use the meeting Gleneagles to deliver a breakthrough on aid and trade with the Third World. Campaigners claim current trade policies, debt and a lack of aid are costing lives in the developing world. What did the summit achieve?